While everyone awaits the amazing fashion trends launched at NYFW, I wait to see the creations done by CND nail artists. Favorite of many fashion designers and fashion houses, CND always brings out something unique and mind blowing just like those fashion trends. Complementing the collection, lighting and music, each CND nail art creation is amazing. Let's have a look at some of them done for NYFW S/S 2018! To set off the silver-dusted nails, the CND team of nail professionals chose two bold CND Shellac shades: Hot Pop Pink and an electric orange from CND’s upcoming Summer 2018 collection. The bright tones were shown in both gloss and matte finishes (utilizing CND’s new Shellac Matte Top Coat) on the elongated oval shapes of the nails. For Jeremy Scott's show, CND created silver-dusted fingers and bold color to highlight the futuristic feel of the collection. CND artists used Swarovski crystals, skulls and safety pins to translate the feel of high fashion decadence. Contrary to the minimal nail art used by most of the fashion collections launched in NYFW, CND creation done for Libertine was something refreshing. 3-D nail designs were created to express the feeling of self indulgence and punk couture. 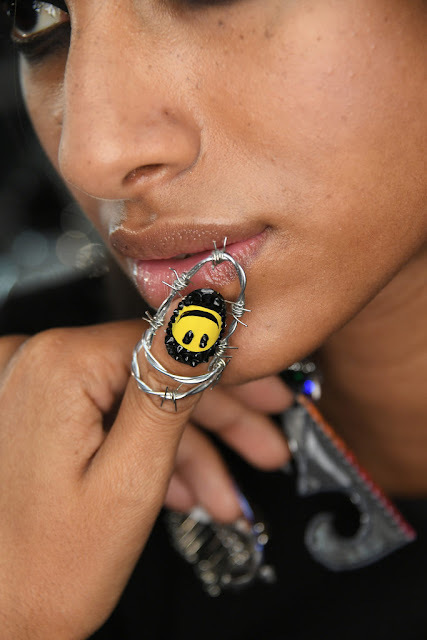 Some designs showed crystals in the shape of emojis while other styles showed intricate details that screamed punk glam. Which your favorite CND runway nail art look? Share with me in the comments below!